Continental Cup holders Arsenal came to town on Sunday in a group match for this year's competition and outgunned the Rooks. A big crowd of 945 were shown a masterclass in elite women's football but the Rooks battled all the way in what was an exciting encounter. 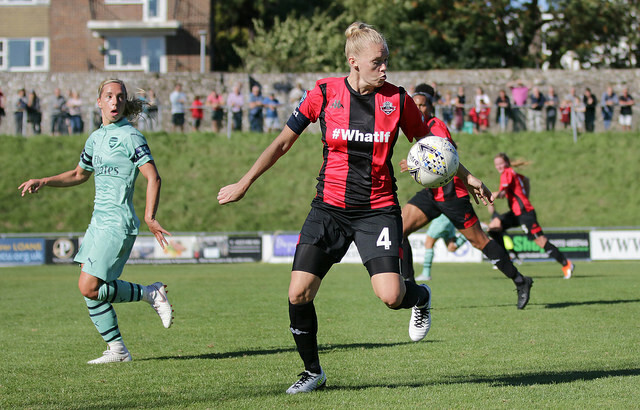 Arsenal let their class and superior fitness show in a fine display of top-class WSL football at the Dripping Pan. After the opening goal from Danielle van de Donk, the Gunners settled into a fine rhythm pf passing and movement that pinned the home side in their half. Arsenal ‘keeper Peyraud-Magnin was a by-stander for much of the first half as her team-mates, led by the effervescent Lisa Evans out wide with Jordan Nobbs pulling the strings. Arsenal’s second was unlucky for Lewes.Amy Taylor made a fine block on Vivianne Miedema at Baker’s left-hand post, only for the ball to bounce straight back off the Arsenal 11 and over the line. Taylor and Faye Baker fought to keep their side in the contest, but Katie McCabe made it 3-0 before a flurry of free kicks and two penalty awards put the WSL side out of sight. Miedema and Kim Little each completed a hat-trick, the latter a dead-ball trio of two first-half penalties and a second-half free-kick that rebounded in off the left post. The second penalty, awarded on the stroke of half-time, looked harsh on Natasha Wells, who collided with Miedema after the Arsenal player appeared to trip on the ball. Lewes continued to work hard, McIntyre and Rutherford making blocks and chasing the ball, but Arsenal’s ability to move the ball quickly, with players swapping positions at will, gave the visitors complete control. They did make inroads into the Arsenal half late on, winning two corners and two free kicks which briefly threatened, but Arsenal saw off the danger, capping an impressive display with Little’s 68th minute free-kick. “Wednesday night we’re up against Crystal Palace and again we have Leicester City here on Sunday, that was the thought process behind taking players off, so they haven’t got so much of the game in their legs. You can’t take everyone off, unfortunately!"